After years of chemicals mismanagement resulting in the widespread contamination of wildlife, humans and the environment, the reform of chemicals legislation in Europe offered a unique opportunity to secure safer chemicals for the future. WWF saw REACH as a once in a lifetime opportunity to ensure this new legislation made a real difference. From 2003 until 2006 WWF ran the DetoX Campaign to exert maximum influence on the content of this mammoth legislation. WWF’s objective was to ensure that the newly proposed law on chemicals would help identify and phase out the most hazardous chemicals. It also aimed to make safety information on all chemicals in the EU market publicly available. WWF’s DetoX Campaign combined policy work with an ambitious communication programme in order to create awareness amongst decision makers and the public on chemical contamination. 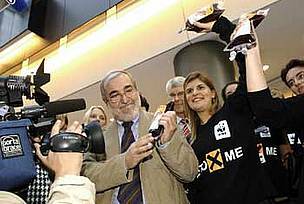 Between 2003 and 2006, WWF carried out blood tests throughout Europe on some 40 Members of the European Parliament, 14 Ministers, doctors, scientists, celebrities and, in 2005, 3 generations of 13 European families. In all these cases, the results showed that people are contaminated with a cocktail of persistent, bioaccumulative and toxic man-made chemicals, for some of which, consequences are still unknown. WWF’s DetoX Campaign was highly successful in making European citizens and decision makers aware of the shocking lack of safety information for the large majority of chemicals used in daily life. Co-operation with scientists and medical experts and their research on chemical contamination in wildlife and people helped put the issue under the spotlight. Daughter of the Belgian family showing her blood sample in a test tube. 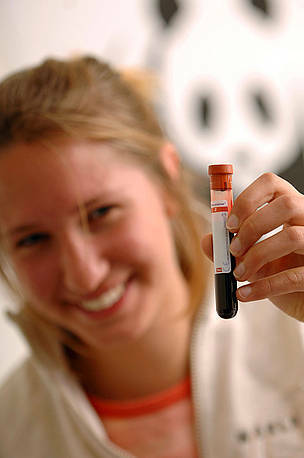 As part of WWF's DetoX campaign, WWF conducted in late summer 2005 the first European-wide family bloodtesting survey.